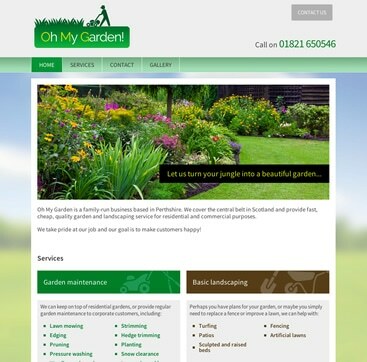 Oh My Garden was a new startup business proving garden services in Perthshire. They approached us looking for a logo, corporate identity and website to help them establish credibility with potential customers. With the new logo established, we created a number of homepage mockups and worked with OMG to develop a final version that would become the basis of their website. In addition to the new site and logo, we designed and printed business cards and also ran a short SEO campaign to help their new site rank for keywords important to their business.